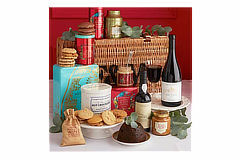 "Introducing our most comforting hamper of all, this is certain to warm you from the inside out. Think warming tipples of every kind, biscuits beautifully spiced with all things nice, our most flavoursome jars and much more. Beat away the winter blues with this very special hamper." The prize draw closes on 15th December at 9.00pm.